Well I finally got around to making a new wall, and I am pretty pleased with the result. Okay so basically I used a stock for the background, edited and enhanced some aspects and added my own stuff. Added a couple gradients, and hue/saturations, photo filter, and all those other effects. Took me a while to do the extraction, but I think I did a nice job. Then I added a texture and lowered the opacity a bit to get the effect that can be seen in the wall. After I added some filters to give it a painted sort of look, then I added the text. Please be sure to leave comments/criticisms, and, of course favs, if you wish. (Even if you don't, lol, jk). Browse Shining Tears Gallery: Recent | Popular. Wow!It's so cool!I like it a lot!Thanks for sharing! 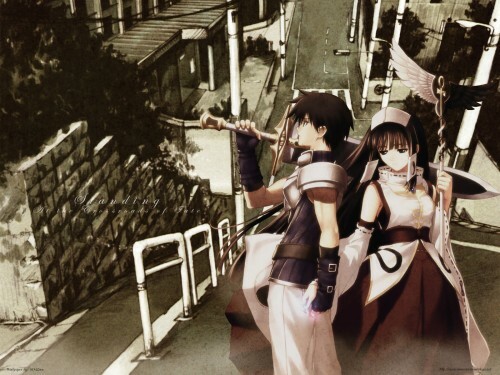 yoshitoshi abe and tony taka togethers :) the background is from lain artbook, no? Nice work getting the stock photo to have a similar feel as the characters. I enjoy your use of neutral colors throughout too, though the becomes hidden in the pattern of the wall's light and dark areas.